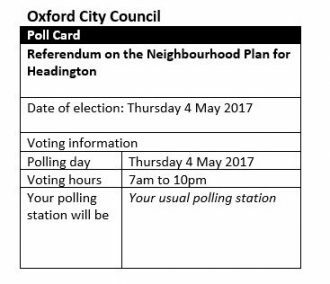 Headington Neighbourhood Plan – What’s next? After the rounds of consultations, the City Council have had the Plan examined – a check by an independent planning professional to ensure that it meets the legislative requirements. The examiner’s report has now been received and, working with the City, the Steering Committee (SC) have been looking at some changes to meet his recommendations. The SC will be reporting on this at our Forum meeting on 8 February. The City Council, as planning authority, will then make a decision whether the plan can go forward to a referendum. If the timing all works out, then it should be in time to have this coincide with the County Council elections in May 2017. Although not as exciting as some referendums we’ve had recently, it will give people on the electoral register in the Plan area the final say on whether the plan is adopted. If that passes, then the Plan will have to be taken into account in planning matters, but also in other City and County strategies.